Accounting major Julianne Kramer learns about opportunities at a recent IU Southeast career fair. Job and career fairs offer students immediate access to area employers. (NEW ALBANY, Ind. )—IU Southeast students will have a chance to meet with more than 40 area employers at the Fall Job Fair, to be held on Thurs., Oct. 13, from 12-2 p.m. in the Hoosier Room. UPS, Kroger, Norton Healthcare and Unique Management Services are among the companies with recruiters or representatives attending the fair. 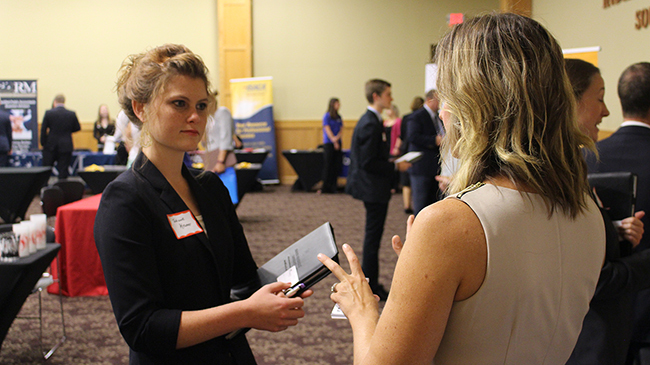 “The benefit of this event is that students can meet with many employers within a very short span of time,” said Lynn Prinz, assistant director of the IU Southeast Career Development Center. By visiting the CDC website, students can learn which employers are attending, and can research the firms in order to prepare or refine their introductions. “Students should bring resumes, dress at a minimum of business casual—no jeans or flip flops—and prepare how they want to introduce themselves to an employer,” said Prinz. To help students navigate the event, the CDC will staff a table at the campus Coffee Shop in University Center South every day this week at noon, to coach students on their resumes and introductions. The CDC also offers Walk-In Wednesdays between 12-3 p.m., to help with any aspect of interview, including what happens afterward. These finer points of making a good first impression and following up are more important today than ever before, according to Prinz, because the job market has become more competitive as the economy has improved and there are more qualified applicants available.